How do you get your kids to care more about and take action on improving the environment, when the world they’re focused on is on their iPod, their Wii, their phone, and online? If you’re SustainLane, you meet them where they are, and create a web based animation series and also show it on TV, on Earth Day Television. 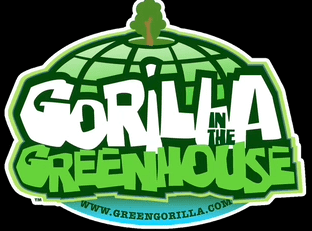 Gorilla in the Greenhouse, an episodic show premiering today, doesn’t preach at kids, but instead engages them on their terms and empowers them to take action. Animated by the people behind such web classics as The Meatrix, it features four smart kids and a wise green gorilla, facing the big green challenges of our day, with inventiveness, action, and most importantly, a rockin’ song. Not many people could pull off making a catchy tune about a garbage island in the Pacific Ocean, but in the first episode, “The Great Pacific Garbage Patch,” they show otherwise. With people such as Ralph Guggenheim, one of Pixar’s founders producing, this moves beyond merely being entertainment to being a bridge to further conversation with your children about things happening in the real world, and what can be done about them. factory, get out their positive green message to counteract Huffelbot’s actions through their social networks, rally cities to ban plastic bags and then create their own eco friendly alternative. 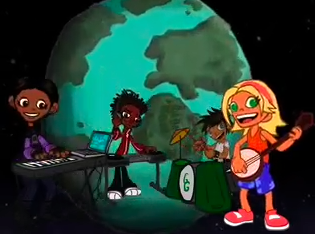 And, in a nod to how times have changed since we watched Schoolhouse Rock, this time it’s the kids making the music, in their band The Greenhouse Gang. Giving structure and resources to build on your child’s enthusiasm, they’ve created a curriculum to go along with each episode with actions to take, and additional videos to deepen their knowledge. Beyond the garbage island, future episodes will cover sustainable food production, deforestation, global warming, and energy efficiency. Readers: What other ways do you know of to creatively and actively engage your kids in greening the world?